My daughter went camping last weekend. It was the 20th of a somewhat mild January but still the forcast was for -5 degrees C. She slept outside - under canvas with snow in the forecast. There are other ways to wait for Spring, then knitting. 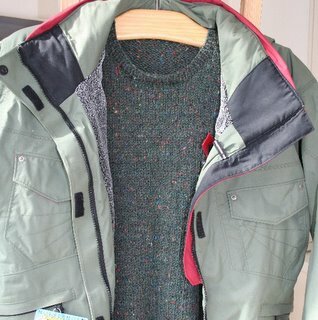 One could, simply, wear the garments knit for them and ski or sleep in the snow! Well, she went camping, but did not take the sweater that she had commissioned last year. " 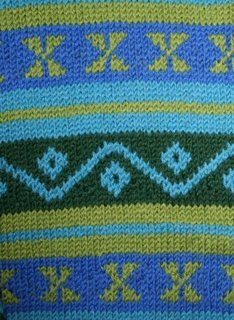 I would like a sweater in two shades of blue and two shades of green." A done deal! I think that one of the greatest pleasures a knitter has, is to have someone wear, the garments knit, with love, for them. Obviously, I have failed as both a knitter and a mother. 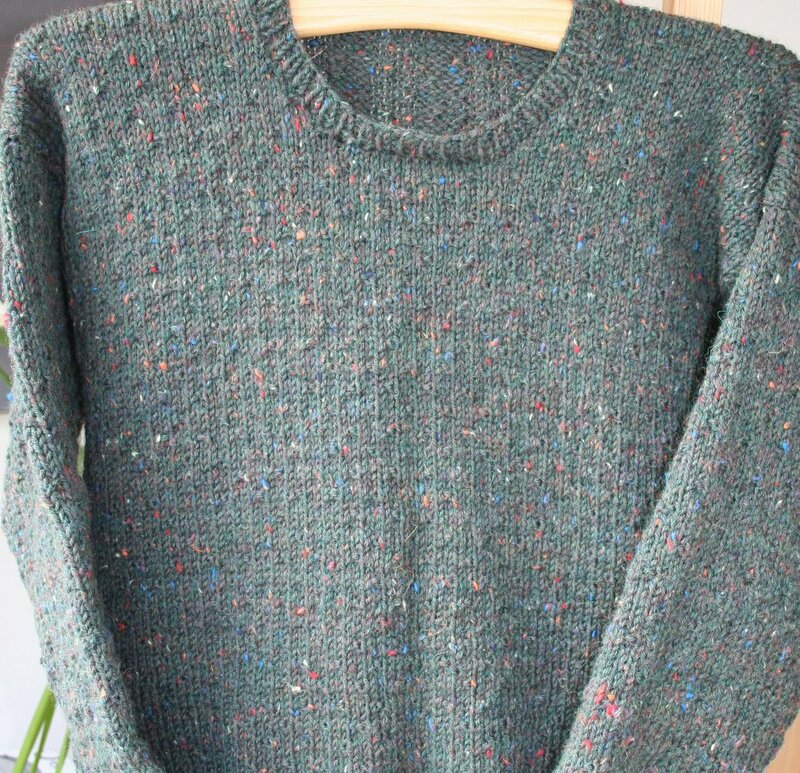 I am not sure what it is in this basic crew neck pullover that doesn't make it! I see a "fuse" there - OK it's not green. I see flowers. I even see divining rods. But somehow the force has not been synergized. Any ideas? I wear it - I have drawers of sweaters - mis-fits that I wear. Do you think that someone is trying to tell me something? First, there are the "sausage sweaters" - sweaters just a tad too small for the recepient. "It's lovely, dear, and I am sure I'll lose weight - sure you're 100 something lbs now - if you lose anymore weight, I'll be knitting a coffin sweater - you know the ones with the pattern on the front only! Then there are the n-i-c-e sweaters, as in, g-e-e-e this is really n-i-c-e...NOT! I am sure I have knit a few of these over the years, but everyone has been too polite to return them, has never worn them, and I have forgotten about them, having extracted my pleasure in the knitting of them. I try. I knit very plain ones - too small - yes I did my swatch - you grew. I knit fancy ones - too big - you shrunk. Nice but I don't like green. Great, Mom, but.... I know it... doesn't have the Nike label on it. Please, give me that pattern that will connect with the 13 & 14 year-olds of this world, so as not to have my children sleeping outside (on supervised camping trips only) in frigid winter in some polar fleece from W...M..T or the like. Perhaps I will just have to be content with wearing the sweaters that others won't. I treated myself to a ski outfit this year. Yes, it was on sale - last year's stock, but it was new and the right colour - loden green. But not the right loden green to go with the aforementioned sweater. Colours, some how, are never the "right" colour. There is a conspiracy in the fashion industry to alter just slightly colours from year to year so that you are forced to either spend hundreds - some spend thousands - on new clothes or look hideously mis-matched. I lean to the hideously mis-matched. In fact, I think that there is a cult out there, or at least there should be, for our ilk. Anyway, once again, I tried to "fit in". I had to go hunting for a sweater to wear that would "match" the ski jacket. 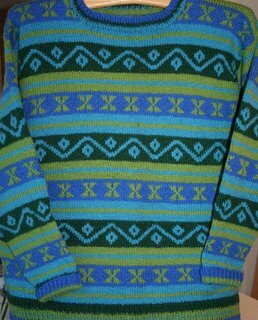 I vaguely remember a tweedy green thing being knit on vacation in Scotland - we were visiting my sister-in-law in Edinburgh - and I had a pretty good idea where to find it. AHA! There it was under 3 basesball outfits and a pair of soccer shorts - almost never worn - dream on. It was never worn! I put it on. It fit perfectly! and matched the ski jacket. Hand me my poles, my MP3 player, point me in the direction of the slopes and push! Wow, I really dig your blog man. It's so cool your into sports like that. I wish I had the guts to do the same. I dared to make a website about it: eXtreme Sports, Greetz Xtreme!